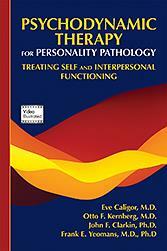 Deftly combining contemporary theory with clinical practice, Psychodynamic Therapy for Personality Pathology: Treating Self and Interpersonal Functioning is an invaluable resource for any clinician seeking a coherent model of personality functioning and pathology, classification, assessment, and treatment. This insightful guide introduces Transference-Focused Psychotherapy—Extended (TFP-E), a specialized but accessible approach for any clinician interested in the skillful treatment of personality disorders. Compatible with the DSM-5 Section III Alternative Model for Personality Disorders—and elaborating on that approach, this volume offers clinicians at all levels of experience an accessible framework to guide evaluation and treatment of personality disorders in a broad variety of clinical and research settings. Eve Caligor, M.D., is Clinical Professor of Psychiatry at Columbia University College of Physicians and Surgeons, and Director of the Psychotherapy Division and Training and Supervising Analyst at the Columbia University Center for Psychoanalytic Training and Research, New York, New York. Otto F. Kernberg, M.D., is Director of the Personality Disorders Institute at Weill Cornell Medical College, Professor of Psychiatry at Weill Cornell Medical College, and Training and Supervising Analyst at the Columbia University Center for Psychoanalytic Training and Research, New York, New York. John F. Clarkin, Ph.D., is Codirector of the Personality Disorders Institute at Weill Cornell Medical College and Clinical Professor of Psychology in Psychiatry at Weill Cornell Medical College, New York, New York. Frank E. Yeomans, M.D., Ph.D., is Clinical Associate Professor of Psychiatry at Weill Cornell Medical College, and Director of Training at the Personality Disorders Institute at Weill Cornell Medical College. He is also Adjunct Associate Professor of Psychiatry at the Columbia University Center for Psychoanalytic Training and Research, New York, New York.